2 Weeks course is for the international students who want to learn K-beauty’s basics or for ones who want to strengthen their skills for future career. The course includes Korea’s representative makeup style: K-Beauty, K-Pop, K-Drama, and Wedding makeup. For each theme, there will be at least 2 days. 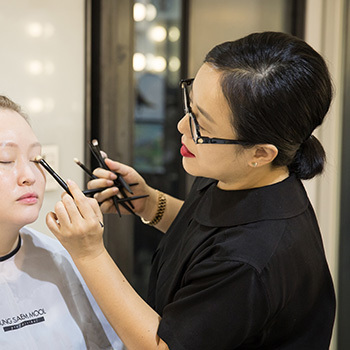 Students will learn the newest trends as well as intensive base makeup, brush techniques and especially color perfection based on KEY7 rules. There will be English interpreter in every class and the instructors will give students advice after they finish their demonstration. Also there will be a day of special lecture from Jung Saem Mool. She will share her own makeup know-hows and beauty philosophy. Beginners who want to start with their make up interest or for ones who want to strengthen the basics for future carrier.